I hope you like the “One Thing in Common” segments, because we’ve got yet another one this week! The four records in the first segment are wildly divergent, but they all have one thing in common. You can make what will likely be a futile attempt to figure it out while they’re playing, or you can just sit back and relax, enjoy the music and let me tell you the commonality at the end of the set. I suggest the latter! On last week’s show we heard a record by Eddy Thomas, who was sometimes incorrectly credited as Smith Ballew. Eddy Thomas deserves more recognition, so he gets his very own segment on this week’s show. A couple of weeks ago you heard about my friend Dana’s father, the locomotive engineer. This week’s you’ll find out about Dana’s grandfather, who engaged in an rather unusual activity. We’ll also find out the origin of some things and continue the cuddling we started last week. 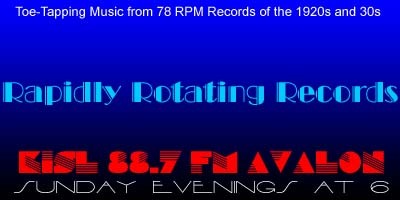 There are at least a couple of records making their RRR debut. If you enjoy the show, please let us know by leaving a comment on the website or the Facebook page or sending an email to Glenn@RapidlyRotatingRecords.com. . And remember, your requests and topic segments are always welcome. As always, just click on the link below to instantly listen streaming online and/or download the show. Best wishes for a safe. healthy, happy and exceptionally prosperous New Year. I’ll Get By – Ben Bernie AHO / Eddy Thomas, v.
Another Kiss – Jack Denny AHO / Eddy Thomas, v.
Where Did You Get That Name? – Harry Reser’s Syncopators / Tom Stacks, v.
Caressing You – Jacques Renard AHO / Charles Wolke, v.